Summertime leaves a lot of room for exciting activities such as pool parties, summer campouts, family reunions and road trips. But what about the days before noon, early Monday afternoons and warm evenings? Not every day is filled with a planned event, and your children (and yourself) will be looking for creative ideas to entertain each other. 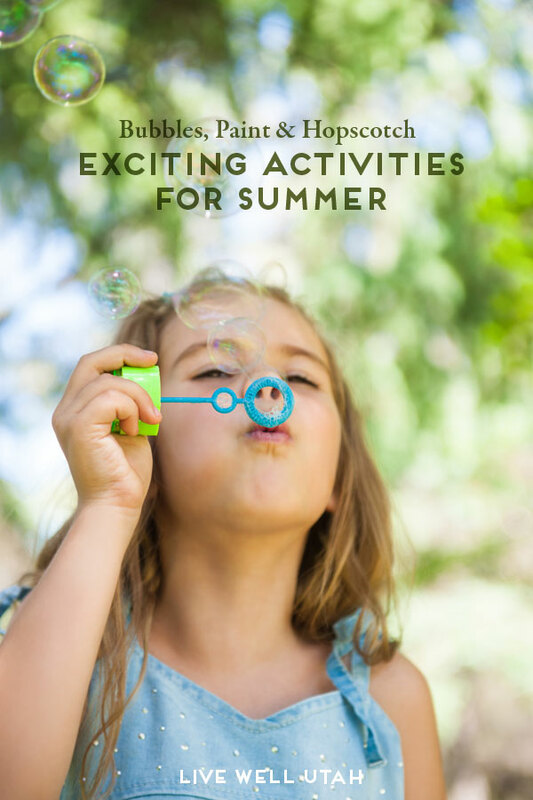 These simple activities can be achieved inside or outside and are inexpensive — not to mention they can be excellent learning experiences and fun for all ages. Mix the above ingredients together. Divide the paint into three containers and add liquid watercolors until you get the color you desire. Use paintbrushes to paint on the sidewalk, and et dry. Liquid Watercolor. Use watercolor palettes and drop each individual color chip into a small bottle of water and shake it to dissolve. This could substitute for all of the water in the recipe. Just split the powders and pour watercolor in accordingly. Food coloring or tempera paint could be options as well. Fizzy Chalk. Use ½ cup of cornstarch and ½ cup of baking soda. Mix ingredients. Paint on sidewalk and let dry. Pour two packets of Kool-Aid into a spray bottle and fill with water. Spray onto dried sidewalk paint and watch the chemical reaction of an acid and a base. Found via LearnPlayImagine. Chalk Paint Strings. Put a couple extra tablespoons of cornstarch in the mixture until it forms a solid when handled quickly and a liquid when left alone. Use spoons to scoop paint and pull it along in “strings.” When it is pulled it will be a solid, but when pulled slowly or left alone it will be a liquid and will spread out. Dry Ice Bubbles. Pour warm, soapy water over a piece of dry ice in a bowl and watch as bubbles form. Pop the bubbles and observe the magic that occurs. Hot Glue Rubbings. Cut a box or file folders into squares while glue gun heats. With the glue gun, draw letters, numbers, pictures, etc. on the squares and allow to dry. Let children lay plain paper over the picture and rub a crayon across to create the picture. Soft as a Cloud Play Dough. Mix together 1 cup conditioner and 2 cups cornstarch. Add food coloring. Shape, mold and manipulate! Found via PagingFunMums.com. Bubble Wrap Hopscotch. Cut bubble wrap into 10×10 inch squares and number them 1-10. Place the bubble wrap on the ground and play hopscotch! Candy Science. Discover what happens when sour candy and baking soda are mixed together. Sour flavoring comes from citric acid and baking soda is a base. Pour a tiny amount of water over a piece of sour candy (sour patch kids, lemon heads, war heads etc.) in a cup; just enough to dissolve slightly. Pour a small amount of baking soda into the container and watch closely as a quick reaction occurs. Experiment with different scenarios. Shayna Savage is a Utah State University family and consumer science intern in Salt Lake County. She is currently majoring in family and consumer science education at Utah State University. One of her creative skills is teaching kids and adult to sew. She is conducting two 4-H Savvy Sewer Camps this summer. Smooth Operator: 6 delicious treats to make with your blender! this web site is genuinely good and the users are in fact sharing good thoughts.